Join Temple Emanu-El for a special appearance by Monica Lewinsky, noted anti-bullying activist and Vanity Fair contributing editor. Monica takes a hard look at our online culture of humiliation, offers advice on how to overcome bullying, and draws from personal experience. Lewinsky survived to reclaim her personal narrative. During a decade of silence she received her Master’s in Social Psychology from the London School of Economics and Political Science. 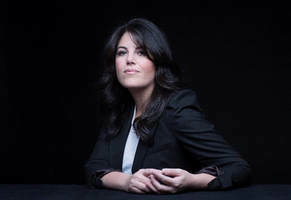 In 2014, Lewinsky returned to the public eye with an acclaimed essay for Vanity Fair, which has been nominated for a National Magazine Award for best Essay Writing, and with a widely viewed speech at Forbes’ 30 Under 30 Summit. $50 for Temple Emanu-El members. $75 general admission. $200 VIP admission includes preferred seating and Meet and Greet reception with Ms. Lewinsky. A portion of the proceeds will benefit the Youth Pride Band 2020 scholarship and Anti-Defamation League. NOTE : If you would like to submit a question for consideration during the Q&A portion, please email Sofia Bitela : sofiabitela2002@yahoo.com – all questions will be pre-screened for appropriateness and relevance. Those submitting questions may also remain anonymous if requested. This event is open to the public, but will be a closed event to the press and media. As such, the speaker’s remarks and Q&A will be off the record.